They've very nearly got the bridge in place and my time here us up. What a great series of photos! Thank you for posting these. 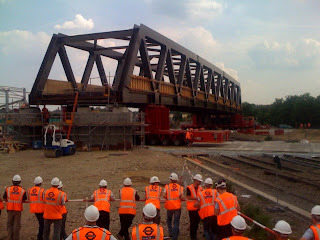 I'm a commuter on the London Bridge line and have watched the construction of the bridge on the trackside with great interest over the last few months. And now to be able to see how the engineers finally achieved its move over the tracks is fantastic. Thank you!! Bridge move live: inches to go.